I am assuming that if you are reading this article on “How to Get Rid of Social Anxiety” then you are suffering through social anxiety disorder and desperately want to overcome from social anxiety. But first, let me ask you one question! What is Social Anxiety? Social anxiety is a discomfort or a fear when a person is in social interactions that involve a concern about being judged or evaluated by others? If a person goes through fear of embarrassment, nervous about being rejected by a group of people or perhaps concern about criticism then he or she must be feeling insecure in his or her normal life. These are the causes of social anxiety among large number of population. I have been through these feelings in the past; I understand what it really seems like, when you actually want to be close to people, however while doing so, you do not actually want to be with them as well. Social anxiety makes it difficult to live a normal life along with it. It can influence your daily life terribly. Social anxiety has long been preventing individuals from experiencing a normal daily life which they are entitled to. It can be tough as you do not know the way to get started to help yourself. A lot of people who’ve social anxiety disorders may possibly have severe headaches, stomach aches, or even nausea or vomiting due to their stress and anxiety. This is exactly why I suggest you to help yourself to get rid of your own social anxiety right now by having proper information and subsequent actions to get rid of SAD. 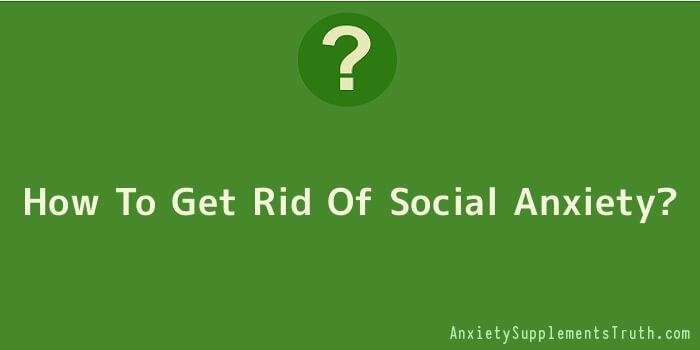 Acknowledgement of problem is the first step for getting answer of “How to Get Rid of Social Anxiety” Depending on how serious your current social anxiety disorder is different kinds of treatments and methods may be required for you. Find people with whom you are comfortable with, and discuss your issues on a personal basis. It could be your personal doctor as well. Your personal doctor may advise medicines, psychiatric therapy or perhaps the mixture of both to get rid of social anxiety. Prescription medication is useful to maintain your signs and symptoms in balance while coping up with social anxiety disorder. Once you recognize your own anxious emotions, you are taking an essential move towards feeling good about your life. Dealing with the reality can be quite empowering, simply because as soon as you identify the issue you can begin resolving it. You open the doorway to figuring out how to feel a lot better. Setting tiny, attainable targets should help you further improve your situation. It will help you accomplish your ultimate desired goal of a more joyful, low-anxiety life. Just take slow, methodical, stable breaths in and out. Practice making them lengthier as well as longer. Additionally, make an effort to inhale using your nose and exhale using your mouth. Another breathing type is belly breathing, where you inhale to your belly area while keeping your chest still. When you get used to belly breathing, you need to do it all the time. Just before you get to sleep or perhaps immediately after you get up, consider 10-15 minutes to simply lie down in bed and rehearse belly breathing. Learning how to meditate as well as take deep & slow breathing will assist you to relax and calm down in societal circumstances. 10 minutes of regular meditation can certainly help remain well balanced and relaxed. Practice deep breathing not simply when you’re anxious but whenever you are normal as well. Studies reveal that easy anxiety-reducing routines can go a long way toward enhancing your emotions in check.